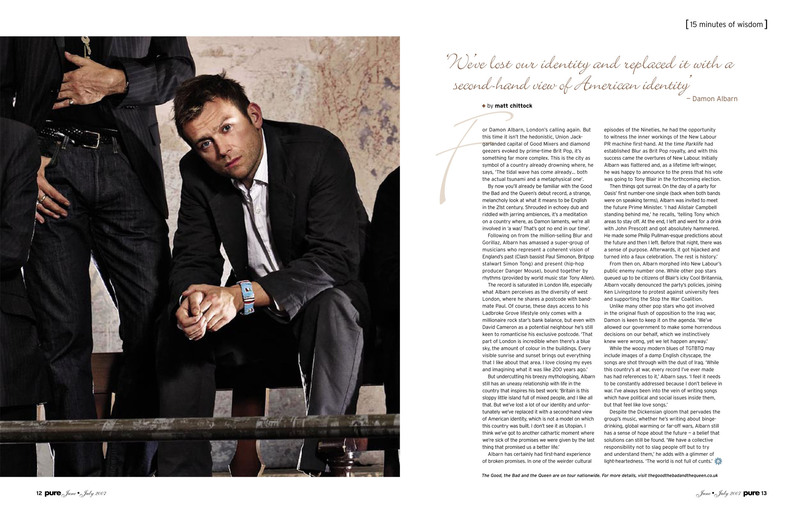 For Damon Albarn, London’s calling again. But this time it isn’t the hedonistic, Union Jack-garlanded capital of Good Mixers and diamond geezers evoked by prime-time Brit Pop, it’s something far more complex. This is the city as symbol of a country already drowning where, he says, ‘The tidal wave has come already… both the actual tsunami and a metaphysical one’. By now you’ll already be familiar with the Good the Bad and the Queen’s debut record, a strange, melancholy look at what it means to be English in the 21st century. Shrouded in echoey dub and riddled with jarring ambiences, it’s a meditation on a country where, as Damon laments, we’re all involved in ‘a war/ That’s got no end in our time’.